Good news for those who have pre-ordered the new Bicycle Missouri license plates--the plate design has now been approved and the plates are moving to manufacturing. People who have pre-ordered the plates should receive their plates in the next 3-5 weeks, if all goes as planned. If you haven't ordered your plates, now would be a great time. From here on out, when you order your plates on line and submit the paperwork (instructions here), you will generally have your cool new Bicycle Missouri license plate back from the Department of Revenue within 4-6 weeks. 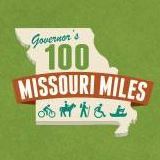 The Department of Revenue has added the Bicycle Missouri plates to their online specialty plate preview page here (Select Design Category: Specialty and then choose "Missouri Bicycle & Pedestrian Federation"). We've been working on the Bicycle Missouri license plates since 2005 (! ), so it is great to see the new plates finally moving towards production. Order your Bicycle Missouri license plate here. FAQ about plate orders here--remember that you can order your new plates any time, there is no reason to wait until your regular registration renewal time.